According to my newsfeed its Sharkweek. I really wouldn't have known otherwise because I don't have cable. But as soon as I found out, my boys demanded to get in on the shark week action, by dressing up. This week the stores started putting out school supplies. I love school supply time. There is something exciting about new pencils, pens, and notebooks. I attended a conference last month and the trainer mentioned that she keeps a little notebook with her to jot down notes, lists, or other things she wants to remember. I loved this idea. At first I didn't think it would work for me, because I didn't want to be flipping through page after page looking for stuff I wrote down. I wanted a way to make it organized into categories. I also wanted something reasonably small so I could carry it with me. I had been using notebooks, and legal pads, and mini legal pads. Long story short I wrote notes to myself on anything I can get my hands on. That means things have the tendency to get lost. While lusting over the school supplies I noticed a little binder, with dividers and college rule paper. So I decided to make my own notebook for jotting down important things. I am so in love with it so far. I have been cleaning out all the junk in the notes app on my phone. 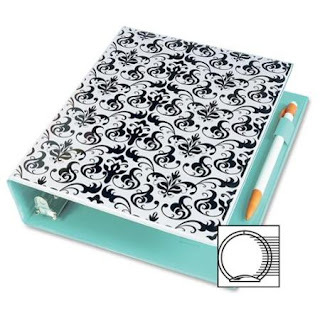 This is the binder I got except my interior is pink. And yup, I've seen the school supplies out. I do buy random notebooks and crayons, markers, etc. I buy what the girls need for school and then extras for crafting and stuff for home. Thanks, Im glad the dogs humor me by letting me dress them up. My roommate has a shark costume for her dog too. It's so funny!